If you want to improve your English this year, there are some most useful tips and techniques from different kinds of learning. Check what you already do and find out how to learn quicker, better and in more funny way. You probably already spent months or years trying to learn English – most probably you understand a lot but you still have some problems with speaking. It is good that you have a goal to learn English but remember to be honest with yourself. If previously a year was not enough to improve your skill, don`t count on that now you will need only a month to start speaking perfectly. Ask yourself how much time you REALLY can spend on learning every day or week. Don`t start three different courses at a time because sooner or later you will feel exhausted by simply having too much English and soon you will lack of motivation. So, decide how much time you can spend on learning – it`s OK if it is only 20 minutes every afternoon or evening. The key is not to spend long hours on learning every day – it`s more about making it a habit you fulfil every day. 2. Find more time on learning. Learning English is not only sitting in front of your desk with your book open. You can learn almost everywhere. If you travel to work it`s a lot of time you can spend on learning. 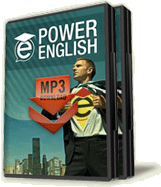 Listen to English texts whenever you are in the car, a train or while you are riding a bike. Learn English when you relax or have a break. If you like watching movies, watch them in English – it will be much easier if you watch them with English subtitles. The same with reading books – start with a short story you already know. When you don`t need to focus on the plot you can spend more time on learning new vocabulary. 3. Use only original English materials. Instead of using students books read only original English materials. If you are afraid that they are too difficult, start with children stories and TV shows. You want to learn English as it is spoken in the world, not like it is shown in your student book. Materials in books for foreigners are made especially to teach you something – often with phrases that no one ever would use in normal life. 4. Learn with materials for English children. They are created to help children learn and memorize new words and that is why the same words are repeated over and over again. The language is simple, the plot easy to follow and everything is shown on the screen: for example if they are talking about apples you can see apples on the screen. The same goes for written stories – those for children are full of pictures that will help you understand the vocabulary. Grammatical patterns used in this kind of materials are generally easier, so it will help you to memorize basic grammar rules. 5. Don`t focus on learning grammar. Instead just listen and read English materials as often as you can. In many schools you learn grammar patterns by heart and then it takes you a lot of time to choose the best tense to say something. When you were a kid no one was telling you what tense you should use. You just heard the same kinds of sentences and you didn`t think about grammar. After a while you started to repeat them – even if you were making mistakes, everyone understood what you were saying. So try not to think about grammar during lessons. Just say what you want – it doesn`t matter if you choose Past Simple or Present Perfect Continuous. It is not THAT important. 6. Don`t be afraid of making mistakes. No one expects from you not making any, especially when you are still learning. Remember that you do some mistakes also in your mother language. But – on the other hand – don`t get mad on your teacher when he is correcting what you are saying; it`s his job. Remember: when you were a child your parents and other people were correcting your mistakes over and over again, as long as it took you to start speaking without almost any mistakes. 7. Repetition is the key. This is one of the most important tips, and also the one we often miss. It is very common for schools to do this: there is some English text in your student book, you read it, learn the vocabulary by heart, you memorize it, then you use it for some exercises, there is a test and... next lesson. You forget the text, the vocabulary, the grammar patterns. That is not the way. Read the text as many times as possible, as many times as you need to really understand and remember it. Record it by yourself or if you are not sure if your pronunciation is OK, ask someone to do it for you. Listen to it and read it several times – it may take you a week, two or even a month – it all depends on how much you spend on learning and on your skills. Finish the text only when you are sure you understand every single word from the text and that you understand it`s whole meaning. This is also best way to learn grammar in more natural way. You don`t need to think about grammar pattern, you hear a sentence so often that is becomes very easy to you to use similar ones not even thinking about grammar. And this is what you want to accomplish. It may be helpful to say aloud the phrases you hear and to try to say the story on your one, when you are alone. This way you can check if you really remember all the words. 8. Always learn new words with their context. It is a good idea to keep a notebook with new vocabulary but put new words in it only with their context, which is the phrase you met them with. Usually, words have more than one meaning – by adding a context to it, you are sure you understand the right meaning. What is more it is also a way to remember whole phrases with their grammar patterns what will help you to speak English. 9. When you choose your materials for reading, try to choose topics you know. For example, if you love to spend time fishing it is best for you to read about fishing in English. Firstly, it is easier for you because you have some knowledge of the topic – you can easily guess what the author means to say. Secondly, while reading about something you like you just won`t get bored so soon. You won`t have to make yourself spend time on English – you will be happy to do this. If you live abroad, you can easily sign up for a course, not an English course, but one you enjoy, e.g. cooking classes. This way you will learn faster, meet more English speaking people and make learning more fun. 10. These tips above were to make learning easier but to accomplish your goal you need a lot of practice. You don`t need to sign up for a course at once – you can talk with “normal” people both for whom English is a native and a second language. Internet is a great place where you can find lots of people of different hobbies and interest. Surely you can find someone you like. 11. Don`t focus only on reading and speaking. If you like watching movies and TV shows, watch them in original or with English subtitles. You will learn new words and phrases. While reading English books, try to choose modern ones – there is no reason to learn Victorian language. Watch and read news – they are short and easy to follow. 12. Of course, you don`t need to guess meaning of every word. Equip yourself with a good dictionary to check word you don`t know. A good dictionary consists not only of words but also how to understand them in different contexts and how to use them properly, for example with what preposition. A good dictionary can really make a difference. 13. Want to be sure you spend time with English every single day? Change your language on your Smartphone or computer – this will force you to use English in different situations. Play your favourite computer game in English. This way you will soon remember all the words you use most often during the day. 14. When you were at school, you probably learnt a lot of vocabulary you don`t really need. You could write an essay about air pollution but have no idea how to name the basic ingredients for your favourite cake. Focus on words you actually can use in your life, the most common ones. You can for example label all the food and pieces of furniture with their English names. You then don`t have to spend time on learning it – you can just memorize them by looking at them so often every day. 15. Use the same materials from time to time. We said before that you should focus on one text at the moment and move to the next one only when you feel you are ready. But after some time it is good to go back a little to remind yourself the material. You may find some words there you already forgot and also find some words you know now with more meanings then you used to. Plan this – you can do the reminders once a month or when you feel too exhausted to learn something new. 16. Learn at your one pace. Don`t think about level you want to achieve – focus on what you do right now. You learn for yourself and only this will guide you to your success. If you are a morning person, learn in the morning. If it fits you best to learn English in the evening, learn in the evenings. If you prefer to spend time in the library – go there, but if you rather not sit for long, take a walk while listening to English materials. 17. It doesn`t matter at what time you start learning or how long you do this, as long as you do it every day. But when you start don`t finish before you are really over – it is best to say before learning for how long you are going to do this. Switch off your mobile phone, bring yourself a coffee or something else to drink to avoid breaking the lesson. Close the door and tell everyone not to disturb you. This is the time for English!